« Gene Theft and Green People? The Eugenics Archive includes several examples of how African Americans endured dehumanizing scrutiny, categorization, and labeling at the hands of eugenicists and other Americans. Eugenicists believed that race mixing (miscegenation) produced “mongrels” and would lead to the decline of the “higher” white race; some strived to identify and register the race of all individuals to prevent it. 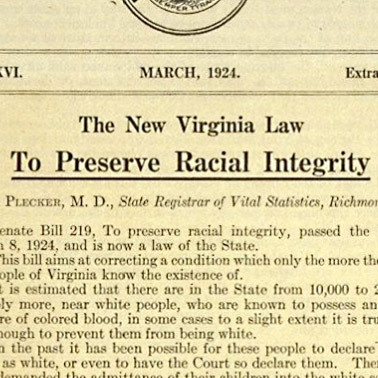 “The New Virginia Law to Preserve Racial Integrity” was enacted in 1924 and provided racial definitions — terms like “mulatto”, “quadroon”, “octoroon”, and “sambo” — to identify mixed races and prevent intermarriage. Several other states passed similar laws and many had penalties for miscegenation — fines and/or prison terms of up to 10 years. 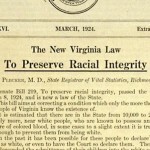 Explore the topics “Race Mixing and Marriage Laws” and “Race and Ethnicity” in the Archive for more on eugenics and race. Print article This entry was posted by Susan Lauter on January 21, 2010 at 2:43 pm, and is filed under Eugenics Archive. Follow any responses to this post through RSS 2.0. You can skip to the end and leave a response. Pinging is currently not allowed.